From the opening guitar strum and, the softly spoken intro “Reservoir Park, 1, 2, 3, 4” to the closing sing along at the end of Armageddon Time, “Now I’ve got you by my side, and I’m feeling alright” The Dutchess And The Duke‘s, debut full length She’s the Dutchess, He’s the Duke careens along in it’s lo-fi immediate glory like a combination of Bob Dylan, The Mamas & The Papas and early Rolling Stones swagger. With the familiar warmth of a lost 60’s classic and the jagged edge of a modern recording, everything old is new again and sounding better than ever. Kimberly Morrison(aka The Dutchess) and Jesse Lortz(aka The Duke) holed up last fall at Magical Basement Studios in West Seattle with Bryan Standridge behind the board of an 8- track and recorded a modern folk classic. It’s chock full of strummy acoustic guitars and percussion with more than enough pure pop melodies and sing along vocal harmonies to have you hooked after just one listen. I’m not the first one to sing their praises and I certainly won’t be the last, jump on the bandwagon now, because this record really is as good as all of the buzz you’ve been hearing about it. One of my personal favorites of the year so far. 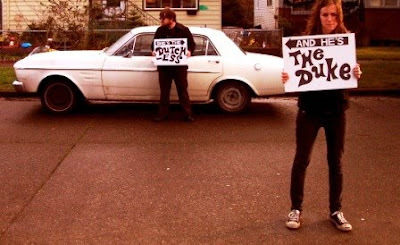 The Dutchess And The Duke are out on tour now with fast rising folky buzz band of the moment, Fleet Foxes. Be sure check them out when they come to a city near you. $ – w/ Pink Reason. I hear you get a free slice of pizza when you buy a beer there.